Power Internet Terminals franchise business opportunity. Free Power Internet Terminals business franchise information. Once in a while advancements in technology open doors to profitable opportunities for those with foresight into the future. Do you have the foresight to utilize tomorrow's technology for profit TODAY? Internet terminals are about to become as commonplace as candy machines, ATM machines and payphones. The wrong question to ask is "where will I find an Internet terminal? The RIGHT question to ask is "where won't I?" At present Public Access Internet Terminals can be found on a limited basis in the airports and hotels of major US Cities. The time to get involved in the market is now! There are still many highly profitable locations available, however, as with any great opportunity these locations will be available for long. Public Access Internet Terminals will be place wherever people go. People will spend money using them. People will own and profit from them. How many of them will you own? Public Access Internet Terminals are expected to quickly become as accessible as pay phones and ATM machines. In fact, they are looking to replace them. The boom of payphones in the 80’s and ATM machines in the 90’s earned entrepreneurial individuals millions of dollars. Now, the new and exciting market of Internet terminals is poised to explode and earn money for the few motivated people that see its future and are ready to act. The explosion of the internet is well documented. The International Data Corporation predicts that by 2005 there will be over 225 million internet users in the <?xml:namespace prefix = st1 ns = "urn:schemas-microsoft-com:office:smarttags" />U.S. alone. As our society becomes more and more mobile an increasing percentage of people will access the Internet through Public Access Internet Terminals. The need for people to be mobile increases daily and has shown no signs of slowing down. This move toward mobile convenience combined with the daily increase of people getting online crates a void that will need to be filled. Our Public Access Internet Terminals fill this void. They are finding their way to locations where people go – everywhere! 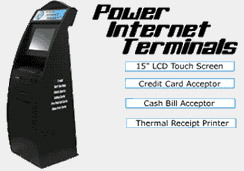 Power Internet Terminals is the leader in public internet access kiosks. This is a proven industry that was started in Europe and is here for you to capitalize on. We offer award winning software along with a state of the art public internet access kiosk. The only work involved is emptying the money out of the terminal. The terminal allows users to surf the web, send/receive email, Instant messaging, send a picture or a video postcard via the webcam, buy prepaid cellular cards and long distance phone cards, and that's only the begining. There are other companies trying to compete with us but if you do your research you will find that we offer a better kiosk and user friendly software at a lower price. Call and ask about multiple terminal packages. To learn more about the Power Internet Terminals business opportunity, simply complete the form below.